Somewhere in your favorite sports franchise’s front office, a team of analysts is teasing the truth out of a mess of misleading statistics. Regardless of the sport or the data source — Corsi, SportVU, or Statcast — the analysts’ goals are the same: to capture contributions that standard statistics omit or misrepresent, and to find the positive indicators buried beneath superficial failures. The shot on goal that goes wide? In a sense, it’s a good sign, since it might mean more shots in the future, some of which will find the net. The line drive caught by a leaping outfielder playing out of position? A double would’ve been better, but even an almost-double tells us that the player who came close to extra bases has the skills to drive the baseball at a speed and trajectory that would typically lead to a hit. Not all outs are created equal. Whether they know it or not — and nowadays, most of them don’t — all of these quants are re-proving the principle at the core of a product developed two decades ago by a company called AVM Systems, a small outfit founded by Ken Mauriello and Jack Armbruster, two businessmen based in the Chicago suburb of Wheaton, Illinois. AVM’s central insight sounds hackneyed now, but it was — to borrow a latter-day business buzzword — disruptive at the time: Process is important, because results are sometimes deceiving. To Mauriello, now in his mid-fifties, and Armbruster, now in his early sixties, their day jobs’ sports applications were obvious. Mauriello noticed a number of inefficiencies lurking within baseball’s data bank — areas in which the most-cited stats were missing something or inspiring erroneous conclusions. Eventually, he approached Armbruster about building a business based on correcting the record. 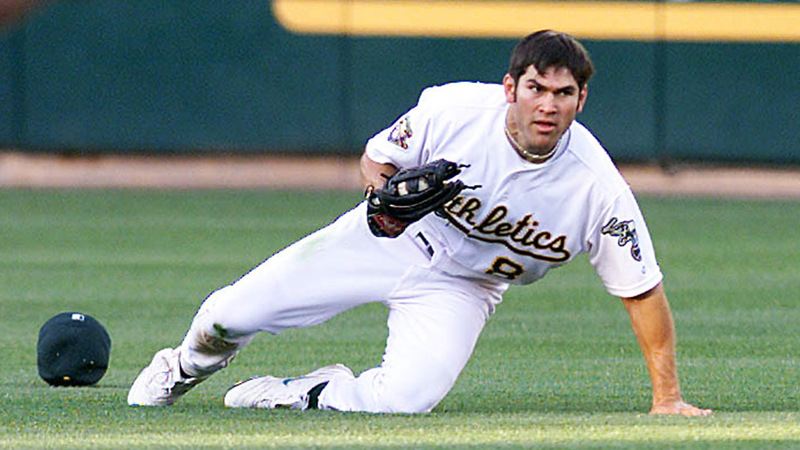 You might remember AVM (Advanced Value Matrix) from its cameo in Moneyball­ as the purveyors of then-Oakland assistant GM Paul DePodesta’s secret weapon, a system that helped the A’s determine (among other things) that the difference in defense between center fielders Terrence Long and Johnny Damon wasn’t large enough to justify the difference in salary. AVM did this, Michael Lewis wrote, by “collecting ten years of data from major league baseball games, of every ball that was put into play,” and then comparing the outcome of each individual play to the average outcome of all plays with similar characteristics. Consider the case of a home run robbery, in which an outfielder perfectly times a jump and pulls back a ball from beyond the wall. Traditional stats would credit the outfielder with a putout, the pitcher with a batter retired, and the batter with an out made, making no distinction between the near-dinger and a lazy fly ball, even though the two types of plays tell us dramatically different things about the abilities of the players involved. AVM would chalk up most of a homer to the hitter, crediting the fielder and docking the pitcher by similar amounts. Home run robberies are rare, but by following a similar process for every play, AVM could arrive at a more complete accounting of players’ contributions on both sides of the ball. As one would expect, the value of this exercise wasn’t always an easy sell to prospective clients. This was several years before the publication of the Baseball Prospectus study that eventually led to BABIP becoming a common fantasy tool, and the idea that luck made a meaningful difference in a player’s performance over the course of a 162-game season met with some resistance. One would think that the march of time and technology would have rendered AVM’s mid-’90s efforts obsolete, but according to the company, which wouldn’t reveal its own process, that isn’t the case. “Some information simply isn’t as irrelevant or redundant as it may seem,” Armbruster says. AVM was so far ahead of its time that even 20 years later, the company won’t concede that the competition has completely caught up. As advanced as AVM’s approach was, it took years for its product to migrate from Mauriello’s imagination to Moneyball. “We scratched on yellow pads from nine months to a year, then probably took another year or so to program,” Armbruster says. Eventually, the two retired from trading to devote themselves to AVM full time, soliciting investors with whom they created a limited partnership. AVM incorporated in 1994, and the founders spent 1995 marketing themselves to teams. Think about where baseball was in the mid-’90s. Moneyball was the better part of a decade away. 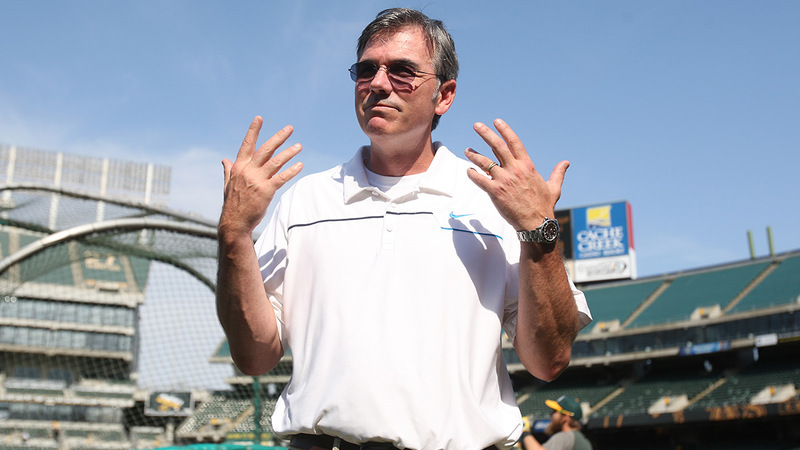 Billy Beane was still an assistant GM; Theo Epstein was graduating with a degree in American Studies. Juan Gonzalez was winning an MVP award with a sub-4.0 WAR (not that anyone knew what WAR was) because he drove in tons of runs. Aside from a few Bill James fans — some of whom, after meeting on message boards, would soon band together to produce the first Baseball Prospectus annual — there was no concerted sabermetric movement. Some of the most prominent examples of statistics seeping into the game — Oakland manager Steve Boros’s computerized matchup stats, outspoken Red Sox stat guy Mike Gimbel — had made their teams into easy targets for the press. Front offices were full of former players, with few of the quants and Wall Street wonks who work for baseball teams today and who might’ve embraced AVM’s pitch. And into that inhospitable environment marched Mauriello and Armbruster, two men with no backgrounds in baseball who were trying to tell baseball lifers about things they were missing that math and computers could reveal. Part of AVM’s strategy was keeping up the appearance of a successful consultancy, as well as mining the mere-exposure effect by being unavoidable. “We were always around them, or tried to be around them,” Armbruster says. “At winter meetings, GM meetings, wherever they were staying, we stayed there.” Mauriello adds, “We didn’t have a penny to our name, and we’re staying at $500-a-night Arizona Biltmore at the general managers meeting trying to rub shoulders with these guys, pretending like we belonged.” The startup wouldn’t have worked without the limited partners, as Mauriello and Armbruster had cut into their savings to stay afloat. Gradually, AVM landed more and more meetings with major league teams. In each meeting, Mauriello and Armbruster would find a club’s brain trust arrayed around a table, their attitudes usually ranging from skeptical to resentful to fearful that computers were trying to take their jobs. AVM had to choose between tactics for turning a tough crowd. Crack a quick joke about the outcome of the meeting not mattering as long as the presentation was sound? Lead with a Gladwellian anecdote about a player who’s better than the traditional stats suggest? Make a PowerPoint? Although they rarely tailored their presentation to particular teams, they were always aware of their audience. “If there were players on their team that we knew were significantly off [from the consensus], especially if we were showing a player much weaker than he was looking statistically, we would certainly not make an issue of that because we knew it was going to become an issue anyway when they looked at it,” Armbruster says. “Sometimes we had to research in advance. We had to very gently explain, ‘We thought you may have some questions about that, so here’s a little research and here’s what we found. 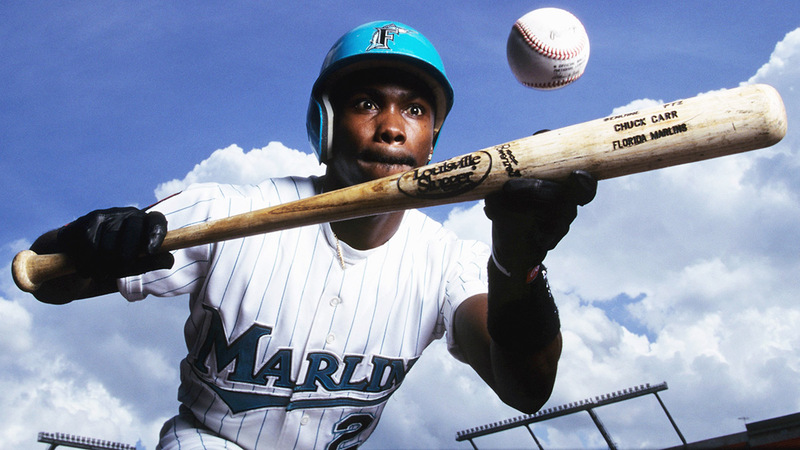 That even though he did this, he did this, and that too.’” Armbruster remembers having that conversation about the lower-than-expected baserunning value of Marlins center fielder Chuck Carr, who finished fourth in the 1993 NL Rookie of the Year voting after swiping 58 bags. Although Carr had led the league in steals, he’d also topped the NL in times caught stealing (22). The following season, he posted a better success rate, but he was also picked off several times. The same problem popped up with whiff-prone sluggers whose power numbers weren’t as impressive as they appeared in the era’s inflated offensive environment — think Henry Rodriguez in 1996, or Sammy Sosa in 1997. “We had some guys who were fairly big hitters with home run numbers, but huge strikeouts and just very one-dimensional — didn’t move guys over, didn’t put the ball in play,” Armbruster says. “It was a home run or bust, pretty much, didn’t draw walks. Our system would not be that impressed. It would give them credit for the credit due, but if a guy hits 35 home runs in a year out of 550 at-bats, that’s 515 other at-bats to do something good or bad, and a lot of those were really bad.” AVM’s value lay in its capacity to put a number on the credits and debits that didn’t stand out immediately, but taking advantage of that value required executives who were willing to listen. Despite the high hurdles, word of mouth started to spread. In 1996, AVM began to get some traction, and by ’97, the company was working with eight to 10 teams. “There were a lot of teams that were willing to nibble at it for a year or two and see,” Armbruster says. So what is AVM’s “own thing” today? It’s difficult to say. The company is extremely tight-lipped not only about its early methodology, but also its post-Moneyball work and client list. DePodesta says it’s “probably been 10 years” since his last contact with the company. Both Stats Inc. founder John Dewan and longtime front-office exec (and current Reds scout) Bruce Manno, who served as an industry-approved brand ambassador for a fledgling AVM, declined to comment.2 Most MLB execs I surveyed either told me they hadn’t heard of AVM or weren’t aware that the company still existed. According to one source with some exposure to AVM’s system, the company had two clients as of four to five years ago: one American League club and one National League club, each of which was paying AVM six or seven figures for league-exclusive access to its insights, including a win-value stat that the teams believed was far superior to the public alternatives. That sort of arrangement would explain why AVM doesn’t advertise or make its founders easy to find without extensive search-engine stalking. On the other hand, it’s surprising that teams would spend so much on consultants, given how much more access to information there is, and how much analysis most teams handle in-house. Moneyball mentions that the A’s were able to replicate AVM’s system after a year or two of use, and other teams have had 15 years since then to be copycats. One team analyst theorizes that AVM still commands such a sum because “Some teams may face the obstacle of not knowing who to hire and how to verify that whoever they hire does a good job at creating an AVM-type system.” In other words, despite the lofty price tag, AVM’s longevity and track record (“As mentioned in Moneyball!”) might be an easier sell than taking a risk on a more recent startup. On the other hand, AVM has had plenty of time to create killer apps, so the company’s new clients could be getting more out of their deals than DePodesta did. It’s taken the online sabermetric community two decades to approximate what AVM was working on before an online sabermetric community existed. So while inquiring minds would like to know what Mauriello and Armbruster are up to now, the answers might have to wait until 2035. Manno initially said he’d be happy to talk but later reconsidered, perhaps after being abducted by AVM agents.